Lighting encompasses many areas of specialty; from moving head fixtures, LED’s, generic lighting or outdoor lighting. Our lighting briefs have ranged from the designing, building and operating of complete lighting shows for events such as awards dinners or product launches; to installing some decorative garden lighting for a party in a marquee. Every job is looked at independently, we pride ourselves in taking careful consideration when suggesting what is most appropriate for the venue and type of event. At LDJ we’ve put together lighting packages in many types of venues from those you’d expect like prestigious hotels, exhibition centre’s or marquees, to those you may not, like a church, disused tube station, bowling alley, boat, schools, or museums; but we’re always happy to find a new challenge. Whether you have a clear vision of what you want to achieve or if you are looking for inspiration, technical advice or guidance; we offer a site visit service that guarantees we can offer you products suitable for your event and venue. A dance floor can be a perfect way to centralise your party guests in front of the DJ helping boost the atmosphere as everybody parties together. It's also a very complimenting feature for decoration and can be the icing on the cake for most events. 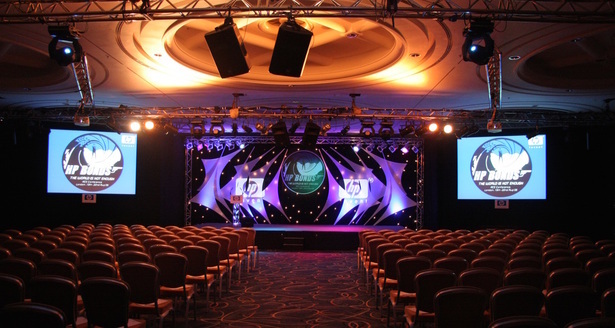 Draping allows us to create a completely new canvass for a stage or room. When fabric and a team of skilled drapers are introduced to an event, it opens up a whole variety of possibilities. Draping may be used to section off part of a room, to create a temporary screen to conceal a stage rig, to create a customized pleated backdrop on a stage, as part of a set or to transform an entire room. As the work is done with new fabric and materials on site there is no end to the possibilities. Clear projection can be the key to putting your message across and achieving a successful conference or even displaying loving memories at a birthday or wedding. By discussing your requirements and following that up with a site visit if necessary, we can tailor an installation to best meet the needs of your event. This will also mean making sure that all other technical aspects of the production (lighting, sound, and set) work in harmony together for the best possible result.